Archie Comics introduces gay marriage and occupy protest movements. Gay marriage, Obama, and the Occupy movement come to Archie’s wholesome hometown. Kevin Keller is the first gay character in Archie Comics. He recently got married. Archie Comic Publications Inc. All rights reserved. Sorry, Elizabeth Warren. Valiant effort, Paul Krugman. Good night and good luck, Keith Olbermann. There’s a new progressive hero in town, and his name is Archie Andrews. Yes, that Archie Andrews. The freckled all-American comic-book teen, his frenemy Reggie, love interests Betty and Veronica, and the rest of the gang who have been the embodiment of middle-American, midcentury values since they first appeared on comic book stands in 1941. Archie and friends celebrated their 70th anniversary in the fictional town of Riverdale last year, where they remain wholesome 17-year-olds frozen in time. But just because they haven’t aged doesn’t mean they’re not evolving. Within the last several years, Riverdale has quietly become a progressive paradise. 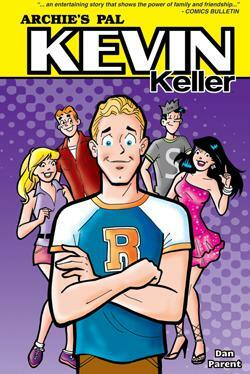 The comic’s most public step to the left was the introduction of a new gay character named Kevin Keller in 2010. The blond, blue-eyed Army brat—his look was inspired by Justin Timberlake—fits in so quickly at Riverdale High that popular brunette Veronica announces her intention to date him. Soon enough, however, Kevin bounds happily out of the closet and is again embraced by all. Kevin was conceived as a permanent character in Riverdale, and Archie Comics gave him his own standalone comic series in February. The pattern continues in July, when the Occupy movement comes to Riverdale. The comic kicks off when Archie wanders past an “Occupy Riverdale” protest on his way to school and must decide which side to take. There’s no better symbol of the 1 percent than rich girl Veronica and her tycoon father, and an early look at the cover shows the Lodges and Reggie in opposition to do-gooder Betty and a mob of racially diverse protesters. Riverdale remains unrelentingly wholesome, a midcentury hygiene film come to life. On these small-town streets, teachers and parents still preside as respected authorities, kids ride bikes and loiter at the malt shop, and the biggest problem in town is which girl Archie will ask to the next big dance. Even with all the changes, clean-scrubbed decency and simplicity prevail. But now the Archie’s creators seem to be asking, why can’t a wholesome, happy town be a progressive paradise, too? Maybe it’s the memory of this phase that had some social conservatives smirking at Kevin’s introduction; “Forget about any kids today really having a childhood,” commentator Debbie Schlussel said. “Now, little kids will read about ‘Kevin.’ ” But outrage didn’t really kick in until the company announced last fall that Kevin, now an Iraq war veteran, would marry his boyfriend, Clay. (That story line appeared in January as part of the separate comic series Life With Archie, in which members of the Riverdale gang appears as adults in a variety of situations.) For some, the marriage was going too far. “It’s unfortunate that a comic book series usually seen as depicting innocent, all-American life is now being used to advance the sexual revolution,” the Family Research Council complained. The conservative American Family Association’s One Million Moms campaign announced a boycott of Toys R Us for selling the wedding issue in stores. The leadership at Archie Comics not only didn’t back down, it seemed to revel in the backlash. Co-CEO Jon Goldwater released a statement unequivocally defending the story line: “As I’ve said before, Riverdale is a safe, welcoming place that does not judge anyone. It’s an idealized version of America that will hopefully become reality someday. … Kevin Keller will forever be a part of Riverdale, and he will live a happy, long life free of prejudice, hate, and narrow-minded people.” In March, the company announced that the issue had sold out. Goldwater has ushered in many of the recent changes since he took the helm in 2009. (He’s also currently embroiled in a lawsuit against his co-CEO, who is said to have opposed the new direction, along with Goldwater’s attempts to expand the company.) I asked him recently why he made the shift to socially and politically progressive story lines. “We are progressive, and we do reflect what’s going on with the kids today, but we also have that ‘Mayberry R.F.D.’ vibe, and that will never change either,” he told me. “Riverdale is a place where everyone is welcome, everyone’s included, and you’re not judged by anything but the content of your character.” He was careful to say that it wasn’t Archie who had changed, but Riverdale around him.